Home > User galleries > veryhighonoutput > 1500ma's! Album name: veryhighonoutput / 1500ma's! Wow...I have never seen the BL VHO before! Wow ouch that would hurt my eyes lol! April 1981. I have seen these listed in catalogs but never actually saw one. Whoa a VHO BL, and with an internal reflector must be a real eyeball-burner-outer! I wonder what its meant for.. Tanning lamp? Maybe something like curing plastics or varnish? 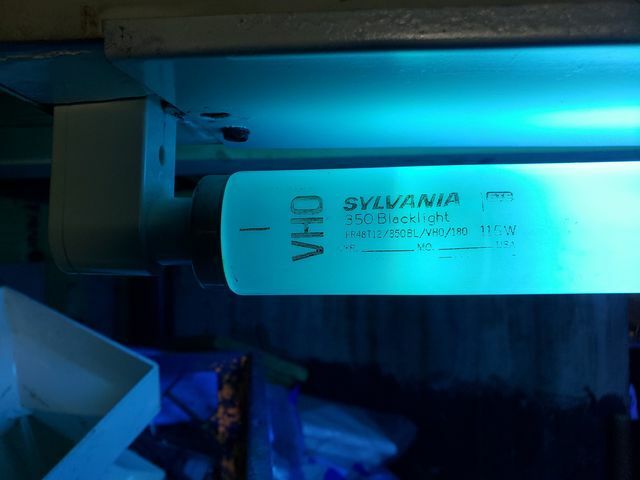 Bro, I didn't even think HO blacklights existed, but VHO?? Added to that, 115 watts?? I thought most F48T12 VHO's were 110 watts? This is the back of the lamp. It has a white coating the other side is way intense. Awesome find. How did I not see that when I was over? Because we were burnt out from looking at 1000s of lamps. It was a long day. That was true. Can't wait to do it again. I didn't get home till 11pm. Ha! Big day for sure. I still have to go through the incandescents and the F40 tube box.